I went camping last weekend, and boy did we eat well! After the whole Amazon-bought-Whole-Foods news bite recently, the DH went shopping at Whole Foods to see what the furor was about, and bought most of our camping food there. (As I said, we ate well.) There were some Portobello mushrooms that he had picked up, all nice and juicy plump, and he grilled some of them on the camping trip, along with the steaks he bought (and grilled them just plain for me, his beloved vegetarian spouse) but there were still a couple mushrooms left after the trip. What to do with these high caliber morsels of mushroom heaven? Fry ’em up and toss them in my next pasta bake! Sound boring? Not at all! I picked some basil from my balcony garden, added it to some frozen pesto I had made a few months ago (made using almonds instead of pine nuts because that was what I had in my cupboard), tossed it with some pasta, added in the mushrooms after frying them to an aromatic buttery golden colour, topped it with homemade breadcrumbs and aged white cheddar, and voila, a lovely casserole! So, so, SO good! This dish is worth making again and again! Sophisticated enough for an adult dinner, but easy enough for a family meal with kids. The Portobello mushrooms add a nice meaty flavour and texture, and who doesn’t love a cheesy crunchy topping? Want to duplicate the dish? Let’s! Fry (it’s actually a combination of frying and toasting) the breadcrumbs in 1/4 c. butter. Set aside. Chop the mushrooms into large chunks, and fry in 1/4 c. butter, until golden and the juices have reduced. 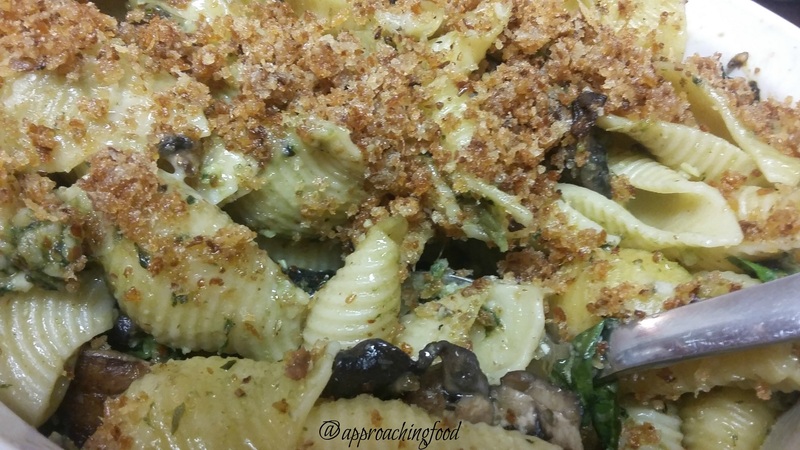 Toss the mushrooms (including any juices in the pan) with the cooked pasta, pesto, and fresh basil. Dump this mixture into a casserole dish, sprinkle the crumbled cheddar on top, and top it all with the toasted crumbs. Bake in a 350 degree oven for about 10-15 minutes, or until the cheese has melted, and the crumb topping is uniformly golden and crispy. Serve, and be prepared for everyone to ask for second helpings! 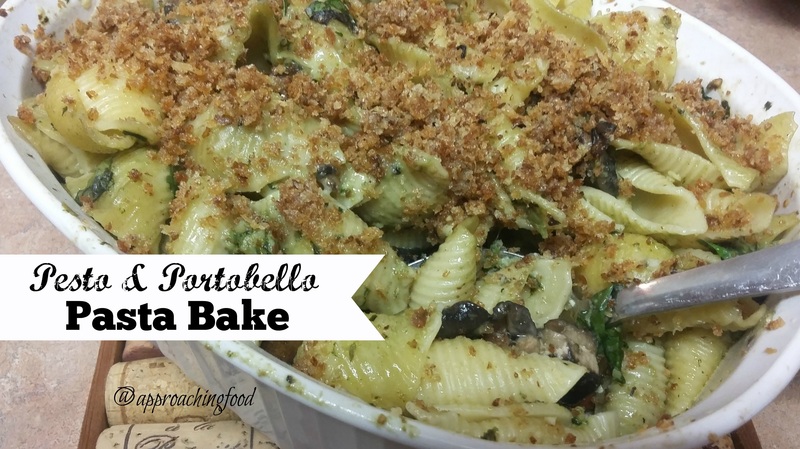 This pasta bake was so good that the DH said (and I quote) “Get it away from me or I’ll eat it all!” (I do so love when my sweetie appreciates my cooking!) Make this for your friends/family/work lunches and let me know what feedback you get! It’s a seriously yummy dish! Next Post: It’s Nanaimo bar time, my friends! But chocolate-ified, because, well, chocolate! This entry was posted in Uncategorized on July 2, 2017 by Margaret.